Alex McBratney holds BSc, PhD and DSc degrees in soil science from the University of Aberdeen in Scotland, and the DScAgr degree from the University of Sydney for research in precision agriculture. After completing his PhD work at Rothamsted Experimental Station in the UK, Alex spent seven years with CSIRO Division of Soils in Brisbane. 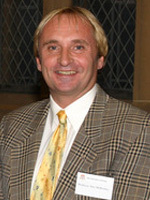 Alex joined the University of Sydney in 1989. He is currently Pro-Dean of the Faculty and Professor of Soil Science and Head of the Department of Environmental Sciences. He is Chief Editor of the global soil science journal, Geoderma. He is heavily involved with the activities of the International Union of Soil Sciences and the global digital soil map project, GlobalSoilMap. Alex is a very experienced research supervisor who has successfully supervised 26 PhD students. He has published some 210 refereed scientific journal papers with an h-index of 44. He holds Discovery and Linkage grants from the Australian Research Council and several from the rural research and development corporations, most notably the Grains Research and Development Corporation.